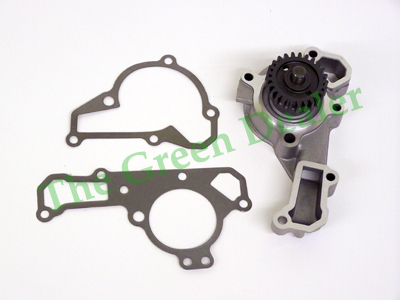 New water pump and gaskets for a John Deere 425 and 445 lawn and garden tractor and 6x4 Gator. All items are brand new and are genuine John Deere parts. This does not include the water pump cover plate. In most cases you will reuse your old cover plate. Received parts in a timely manner. When I tore the unit down to replace I realized one of the gaskets were bad but pump was still in good shape. I went ahead and replaced everything. Fit perfectly with no unexpected problems. It took longer for tear down than replacement. Having used the JD 445 for 5 hours since replacement. No leaks.